We made it safely to Paris! I’m testing whether or not the Iphone 5 camera is superior to my Iphone 4. All of these photos were taken with my new phone, so I apologize in advance for the quality as I’m getting used to it. I felt so organized on the trip over; I’d brought child-sized headphones like these for the flight. I usually do, so that I won’t have to constantly adjust the adult-sized ones given by the airline on the girls–it gets old on a long flight. Unfortunately the entertainment system was down the entire time and the lighting system was also a mess. The light issue made it difficult for the girls to settle in to sleep. It didn’t seem as uneventful as other overseas flights we’ve made. C’s coughing was so bad in the middle of the night that she just lost it…thankfully I caught most of ‘it’ in a blanket. I folded that blanket into a hazmat bag, kindly returned it to a flight attendant and we were golden. Thankfully I’d packed a set of extra clothes (and baby wipes)–but of course it wasn’t enough as C had an ‘accident’ later–poor baby. I’ve touted the benefits of packing cubes. Here they are in action; one, two, three, presto–unpacked! We made a quick Monoprix run for grocery essentials after we arrived. This melon was delicious–perfectly ripe. We picked up these mini-éclairs at Picard, a store that sells generally yummy, high quality, flash-frozen vegetables, meals and desserts. 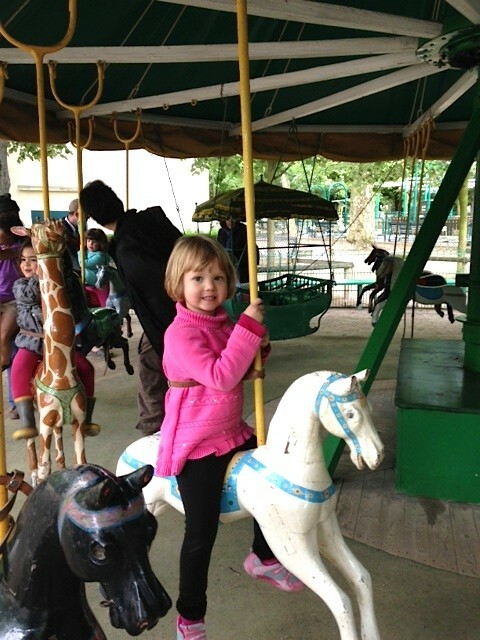 The girls played at le Poussin Vert playground then took a turn on Garnier’s carousel–I love this merry-go-round. 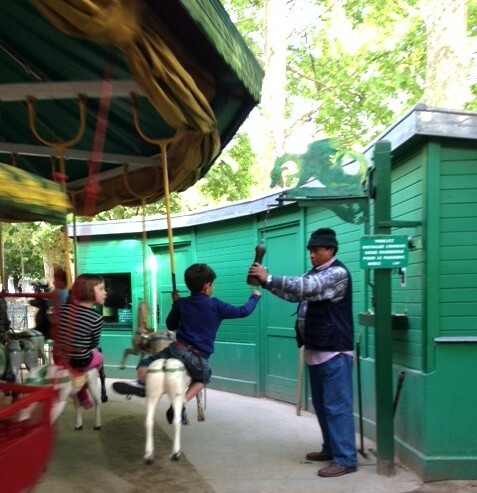 This boy sitting next to J has successfully snagged a metal ring suspended in the wooden contraption held by the ride operator, with his wooden stick. J was cheering him on; she said he hooked 10! I took a walk around the park and stopped by the Fontaine Médicis, one of my favorite fountains in the city. I spent many hours in this spot-not necessarily this chair-reading and writing letters when I studied here 18 years ago (omg!:). We stopped at the cute, off-path Café Fleurus near the park afterwards. Its decor is pretty retro, as in not-updated, and prices are less expensive than those on the main drag. The staff is so sweet to us–it feels like we’re neighborhood locals. More to come on our adventures in Paris! I’ve got quite a few things to see that don’t include the kids i.e. wine tastings, checking out the emerging gourmet coffee scene as well as a photography tour of the capital! If you’re not following me on Twitter, please do, I’ll have more updates there: @kimhlevesque.